Preheat oven to 350 F. Place a 13x9 baking pan onto a cookie sheet. Prepare the batter for the cake mix according to the box directions. Set aside. Cut up butter and place it in the baking pan. Place baking pan in preheated oven for 3-4 minutes, or until butter has melted. Remove from oven. Sprinkle melted butter with brown sugar and use a fork to evenly distribute. Pour blueberries on top of brown sugar and spread around in an even layer. Pour prepared cake batter over the blueberries. 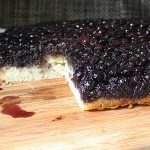 This recipe for Easy Blueberry Upside Down Cake was printed from AmandasCookin.com - https://amandascookin.com/easy-upside-down-cake/ and can only be printed for education or personal use.